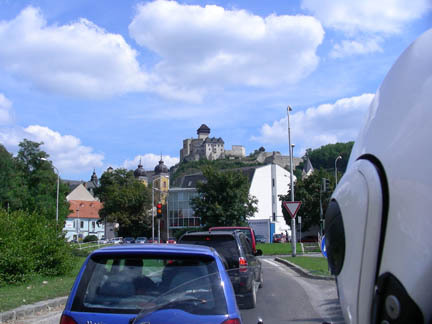 We entered the Slovak Republic (Slovakia) near the town of Trencin with its castle being our first destination. Its castle is being rebuilt in the original style and is available for tours. But first we had to find a place to park. Like most European cities the traffic is heavy and the streets are narrow and the surface is poor. In watching all of this I missed a sign which said, in pictures, No Cars or Motorcycles! 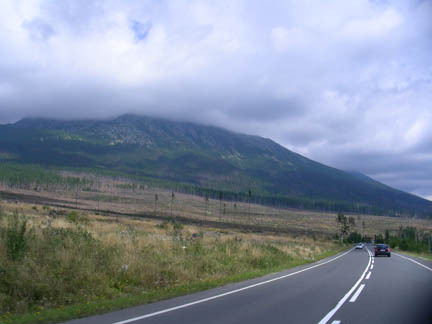 I was pulled over by the police and fined 2,000 Slovakian Crowns right there on the spot, about $100 USD. But I wasn't the only one, the police were making fortune here. 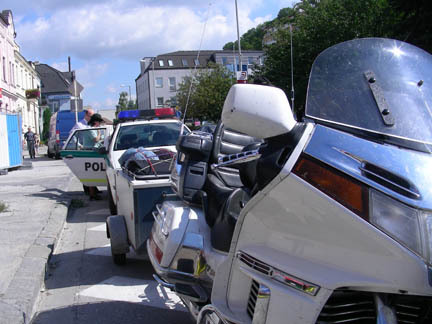 The bald-headed man with the cop at the car is paying the fine too. And we saw several others pay, evidently the sign was new and a lot of locals were getting caught by it also. The strange thing was that the traffic the other way was flowing freely, only our direction was prohibited. We never found out why, we turned around in the middle of the street and went back the other way. After parking, just down the street from the ticket we hiked up to the castle and signed up for a tour (in Slovak, the only option) and wandered along with the group. 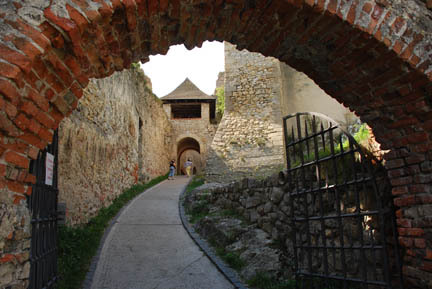 The castle has all the usual walls, gates, arrow slits and tower of most castles. It is about half reconstructed. The earliest foundations date from the 1200's. Most of this reconstruction is following the 1600's castle. 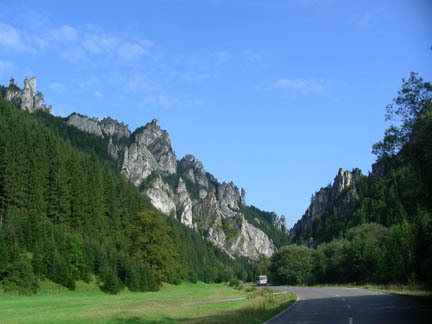 We traveled up to the northern mountains and looked at rocky promontories and forested hills. Along the way we saw several more castle ruins on hilltops that commanded a view of the valley. Evidently this area was a major trade route and the local lords taxed the merchandise as it passed through. We have seen this situation in several countries including Italy, France, Germany, Spain and the Baltic States. The eastern end of these mountains were visited by a tremendous windstorm in 2004. Tens of thousands of acres were laid flat and salvage logging is still going on today. Some of it has been reforested but actually very little. It would have been impossible to come up with enough seedlings that quickly to do the job properly. This is a heavily used hiking and skiing area and has probably suffered from the devastation. 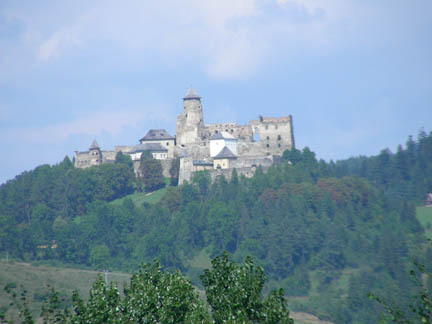 We drove past more hilltop castles and mountains as we turned north to Poland. We are on our way to see an ancient salt mine.